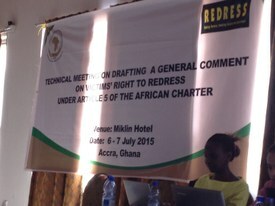 At the 56th ACHPR Ordinary Session, which was held in Banjul, The Gambia, from 21 April to 7 May 2015, the ACHPR Committee for the Prevention of Torture in Africa (CPTA) decided that its first General Comment on Article 5 and the prevention and prohibition of torture would examine the right to redress for victims of torture and other ill-treatment. Previously, in late 2014, the African Commission on Human and Peoples’ Rights (ACHPR) developed a Concept Paper on the development of a General Comment on Article 5 of the African Charter on Human and Peoples’ Rights (ACHPR), to which CSPRI substantially contributed, under the banner of the Article 5 Initiative. The Concept Paper identified several thematic issues which a series of General Comments on Article 5 of the ACHPR could address. 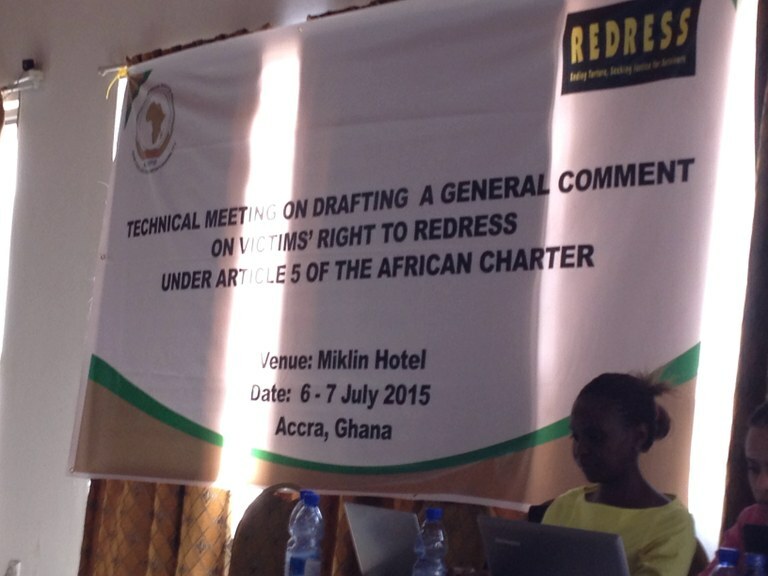 Following the adoption of the Concept Paper, the ACHPR and REDRESS held a Technical Meeting on Drafting a General Comment on Victims’ Right to Redress under Article 5 of the African Charter in Accra, Ghana, on 6 and 7 July 2015. CSPRI Researcher Gwen Dereymaeker attended the Technical Meeting and provided input, more specifically on the right to redress for victims of torture under UN instruments. The objective of the technical meeting was to bring experts on redress and the prevention and prohibition of torture from all over the African continent and ACHPR Commissioners around the table to determine the general outline of the future General Comment. Developing these General Comments will further clarify the State’s responsibilities in preventing and eradicating torture, and strengthen the position of victims of such inexcusable acts. The General Comments will also address the specific African contexts in which these acts are allowed to happen. States should in particular ensure that they put sufficient safeguards in place to protect arrested persons and pre-trial detainees, as the risk of torture is highest in the first few hours following arrest, when law enforcement agencies are required to gather sufficient evidence to continue detaining a person. A lack of resources, training, forensic skills of, and oversight over, law enforcement often leads to a detainee being abused. The ACHPR intends to adopt the General Comment in 2016. CSPRI will continue to closely engage with, and provide its technical support to, the ACHPR and the CPTA throughout the development of the General Comment.